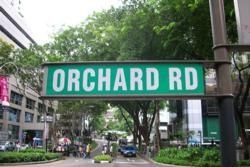 Orchard Road is the Champs-Elysées of Singapore – in some ways perhaps even more magical than the original. Miles and miles of shopping await you – it’s the one street every visitor to Singapore must experience. Once a simple lane between spice plantations, Orchard Road has been transformed into a plush thoroughfare, lined with dazzling shopping malls all along the way, from Tanglin Mall, south and east to Plaza Singapura. 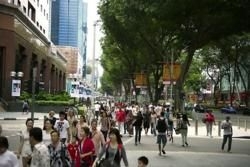 Orchard Road also features luxury hotels, celebrity-chef restaurants, and scores of street cafes and other eateries. We recommend beginning your shopping adventure where Orchard Road and Scotts Road meet, at the departmentstore Isetan. Just opposite is the eye-catching ION, a recent addition boasting glamorous and glitzy high-fashion stores. Further down Scotts Road you’ll find the duty-free DFS Galleria, just opposite from Far East Plaza, with its selection of tailors and bargain shops. Here also is the popular Marriott Hotel, with its iconic green pagoda tower, roof top pool and city-view rooms. After exploring ION, you’ll find your trek’s next highlight just a few metres away: Ngee Ann City, with its Takashimaya department store. In between there’s also Wisma Atria, famous for its Food Republic – a fourth-floor, elaborate food court served by an unusual and convenient outdoor escalator. Next up you’ll encounter Mandarin Gallery, featuring high-end boutiques, restaurants, spas and beauty salons. Opposite the ION and beside the Marriott hotel, you can find Tangs, a locally landmark of a department store, as well as Paragon and The Heerlen, both of which offer a rich mix of international and local brands. Continuing further on, you’ll reach Orchard Road’s more historic stretch, marked first by Emerald Hill – once the home of the wealthy Peranakans. Today, this side-street’s charming houses have been transformed into popular bars and restaurants that come alive every evening. Adjacent to Emerald Hill, The Centrepoint houses the famous Robinsons department store. Opposite, you’ll find 313 @ somerset and Orchard Central, with high-street fashion shops and rooftop gardens boasting fine gourmet restaurants and spectacular city views. It’s an ideal spot for a well-deserved break, after a healthy stint of diligent shopping! Back on the street again, be sure to take a moment to admire the grand entrance of Istana, the official residence of Singapore’s president. The huge compound is adorned with lush gardens, a golf course and many historic relics. If you’re lucky enough to arrive on one of the five days each year that Istana is open to the public – Lunar New Year, Deepavali, Hari Raya Aidilfitri, National Day and Labour Day – it is well worth taking a tour. 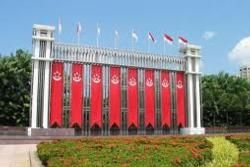 Any day, though, you are free to enjoy Istana Park, just opposite the residence. The park is a favourite of artists and newlyweds, thanks to the 26-metre-long arch that rises from a pool of slowly flowing water. Visitors can also enjoy the many artfully-arranged flower beds, and plentiful tropical trees. At this point, you’ve nearly reached Orchard Road’s end. But that certainly doesn’t mean you’re out of shopping spots. Far from it! 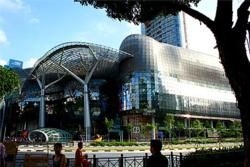 Next to Dhoby Ghaut MRT station, you’ll arrive at Plaza Singapura, the largest mall in the entire area. Finally, a bit further on, is The Cathay, with its art deco façade and splendid cinemas. Of course, even when you’ve explored all that Orchard Road has to offer, there is still plenty more shopping territory to cover in and around Singapore. 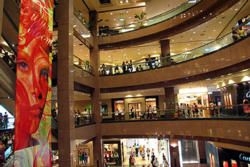 Shopping is, after all, one of the most popular free-time pursuits for many Singaporeans. If you’re not a shopaholic yet, a visit to Singapore surely raises the chances you’ll become one!